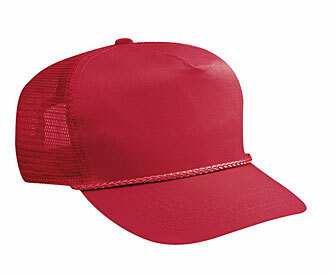 Cotton twill 5-panel regular profile golf style cap, style 538, is offered in 11 color options as shown above. Our cotton twill 5-panel regular profile golf style cap is 65% polyester/35% cotton front with a 100% nylon mesh back. This style has a seamless front panel. Color options are shown above. Features listed below photos. Prices include direct embroidery up to eight colors on caps. For quantities greater than 576, or for pricing on screen printing, call 800-336-0551 or email [email protected].